A major three-year project in the north of Scotland, aimed at the conservation of one of the UK's rarest birds, the black-throated diver, has been awarded a grant of more than �,000 by Scottish Natural Heritage. The total UK population of breeding black-throated divers is believed to be less than 200 pairs. Black-throated divers nest on small islands in lochs, or on the loch shore and around 30% of these nests fail annually due to fluctuating water levels. Others fail due to predation or human disturbance. Divers also produce very small numbers of young, so any lack of breeding success can have a significant impact on the overall population. There are 11 areas in the UK protected under European wildlife legislation for the species. Eight of these are in the north of Scotland including parts of Sutherland, Caithness, Ross-shire and Inverness-shire. The project, which is being run by RSPB Scotland, involves the installation and maintenance of a network of rafts, which provide effective artificial island nest sites for the black-throated divers. These "floating homes" rise and fall with the fluctuating water level, which helps prevent nests flooding and failing. The rafts significantly improve the breeding success of the birds, increasing productivity by over 44%. RSPB Scotland will also undertake annual monitoring of black-throated divers, to determine breeding success rates and identify population trends. 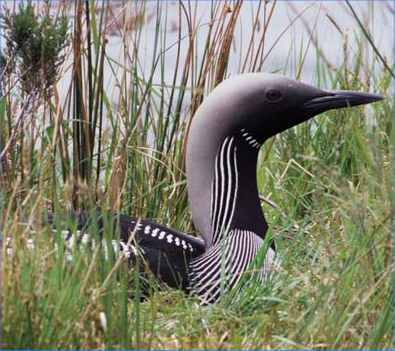 Confirming the SNH grant, development officer, Ian Mitchell, said: "The black-throated diver is a particularly rare and vulnerable bird and an important part of Scotland's biodiversity. We have an international duty to look after it. We are fortunate in that the north of Scotland is a stronghold for this bird. This project will help maintain accurate records of the breeding success of the species in the north. This information will then be used to inform the future management of the main areas used by these birds." The SNH grant represents 50% of the total cost of the project, with the remainder being made up by RSPB Scotland. RSPB officer in the north, Dave Butterfield, added: "Most rafts are now more than ten years old and we have recently started a programme of replacing them with new ones. It has been very hard work maintaining them over the years, but well worth it. Black-throated divers are really responding to the work, which makes it a fantastically successful conservation effort. We are very grateful to everyone who has been involved over the years and to SNH for ensuring this work can continue."